Sweet Sadie's Baking: My Croquembouche! As many of you know by now, I am a devoted member of the Daring Bakers , and this month's challenge recipe was a piece monté, which literally means "mounted piece". Many of us know it as a "Croquembouche" (crunch in the mouth). 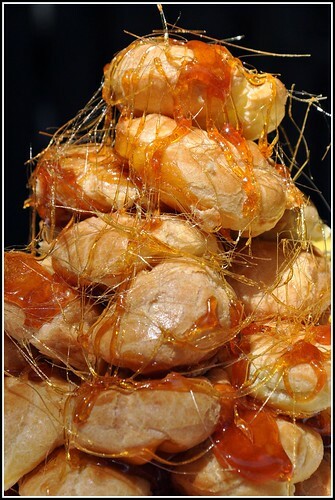 Here is a picture of my Croquembouche. It was a little lopsided but I think I have got the hang of it now. The classic piece montée is a high pyramid/cone made of profiteroles (cream-filled puff pastries) sometimes dipped in chocolate, bound with caramel, and usually decorated with threads of caramel, sugared almonds, chocolate, flowers, or ribbons....sounds wonderful doesn't it? I was thrilled to make this but who would I serve it to? This is kind of BIG!!! I was going to take it to a friend's BBQ, but then it seemed a little awkward to be walking down the street balancing a tower of cream puffs. So I put it off and put it off...until I ran out of time (since I was leaving on a trip to Winnipeg) and had to make it to meet the deadline of the challenge. The only one around to try it was Dan. He was sitting there watching the hockey game when I placed it in front of him (and blocked his view, with my tower of creampuffs) . He had a strange look on his face....a "what the heck was this thing" kind of look!!!! I told him the story...and he tried one... then another...and another. I actually got a little concerned as he ate his way halfway down the tower occasionally commenting how good it was. 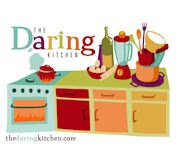 The May 2010, Daring Bakers’ challenge was hosted by Cat of Little Miss Cupcake. Cat challenged everyone to make a piece montée, or croquembouche, based on recipes from Peter Kump’s Baking School in Manhattan and Nick Malgieri. Thank you Cat for hosting the challenge! 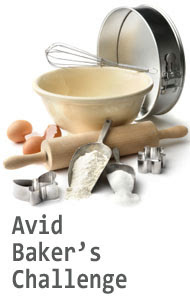 If you would like the recipe, you can find it in the Daring Baker's kitchen. Looks great Penny I hope Dan is not to full. Hey P, your blog is great and easy to navigate! I don't understand why you say...nobody to try it but Dan!!! Well, I will ask Dan to call me the next time he is your only "victim"
Too bad none of the profiteroles rolled my way! I'm just a wannabe that does simple muffins and cookies!